Kenney Mencher: What's the Buzz at The Museums of Los Gatos? 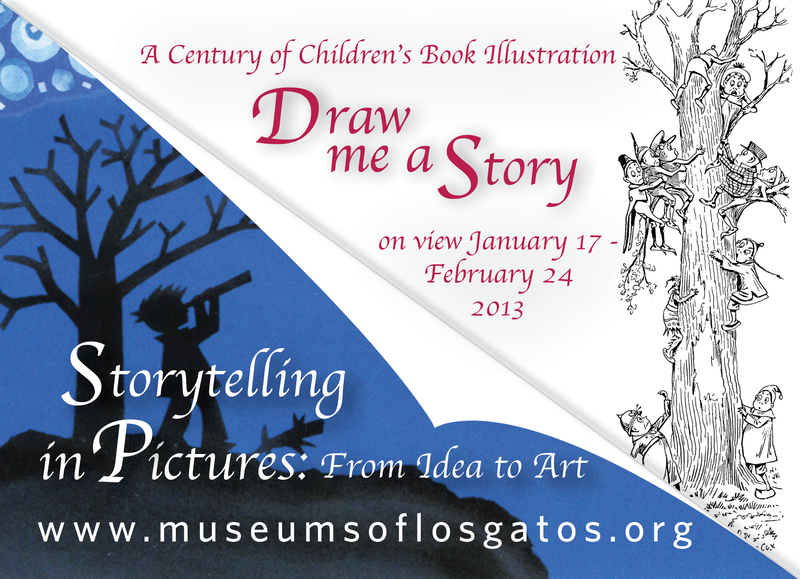 The Museums of Los Gatos presents two concurrent exhibitions, Draw Me A Story: A Century of Children’s Book Illustration and Storytelling in Pictures: From Idea to Art, January 17– February 24, 2013. A good children’s picture book still has the power to whisk young minds off to another time and place—even in today’s world of computer games and high-definition TV. Draw Me a Story: A Century of Children’s Book Illustration and Storytelling in Pictures: From Idea to Art explore bold adventures, classic fairy tales, amazing animals, and imaginative ABCs, all seen through the eyes of artists who created works especially for children. Draw Me a Story, organized by the Cartoon Art Museum in San Francisco, presents original works of art in a thematic and nostalgic trip through the history of children’s book illustrators and illustration techniques. Twentieth-century artists include innovators such as Chris Van Allsburg, Tomie DePaola, Maurice Sendak, William Steig and Rosemary Wells. Storytelling in Pictures: From Idea to Art is an original exhibit organized by The Museums of Los Gatos that showcases the work of Twenty-first-century Bay Area Children’s Book Illustrators. Artists include Bob Barner, Yuyi Morales, Stacy Schuett and Susan Jaekel, as well as digital media illustration (Graphic Novels) by Thi Bui and Emma T. Capps. Both exhibits explore the process of illustration and cover a range of styles, from simple traditional media to more experimental combinations of pen, pencil, paint, ink and digital media. Family Art/Artist Demo Days feature Illustrative-process workshops, family activities and storytelling for all ages. Panelist, Gennifer Choldenko - Gennifer’s first novel, Notes from a Liar and Her Dog, was a School Library Journal Best Book of the Year and a California Book Award winner. Her second novel, Al Capone Does My Shirts, was a Newbery Honor Book and a School Library Journal, Kirkus, and Publishers Weekly Best Book of the Year. Al Capone Does My Shirts was short-listed for the Carnegie in the United Kingdom and has been on the New York Times, Booksense, and Publishers Weekly bestseller lists. Her most recent picture book, Louder, Lili(illustrated by SD Schindler), was published in 2007. If a Tree Falls at Lunch Period, an ALA notable recording, just came out in paperback and her newest novel Al Capone Shines My Shoes—a sequel to the beloved Al Capone Does My Shirts—is a Kirkus, Amazon, Barnes & Noble, and Chicago Public Library Best of the Best for 2009. Her newest novel No Passengers Beyond This Point is due out in February 2011. Gennifer is hard at work on the last book in the Al Capone trilogy right now. Panelist, Summer Laurie - Summer began her story in the San Francisco Bay Area, graduating with an English degree from UC Berkeley. After an eye-opening stint as an account executive with an investor relations agency, she set her sights on the world of book publishing. She began to gather steam down this path at Chronicle Books where she worked in both the marketing and editorial departments during her three-year tenure in the children’s division there. In 2000 she crossed the bay to join Tricycle Press, the children’s imprint of Ten Speed Press in Berkeley, California. As Senior Editor, Summer worked on over 50 books—picturebooks, board books, novels, activity books, fiction and non-fiction for young people up to age twelve. After seven years she took yet another fork in the road and is now an independent editor, working to strengthen each and every word her clients write. Summer is also a children’s specialist at independent bookseller Books Inc. where she has started the “Wild Girls Mother-Daughter Book Club.” And just for the fun of it, Summer produces the children’s and teen programming for the Litquake literary festival and is a prior member of the board of the NCCBA (Northern California Children’s Booksellers’ Association). Panelist, Heidi Long - Heidi currently serves as Town Librarian at the Los Gatos Library. Here, she has focused on developing community relationships and transforming the Library into a community gathering space. Prior to that, Heidi worked as Director of Research for a boutique executive recruiting firm where she learned to appreciate people and connections as two great resources which bridge all fields. Heidi also worked as the District Librarian for a small, rural school district in southern Arizona, just after completing her MLIS degree at San Jose State University. With a Bachelors degree in Literature, the Library is the perfect space to blend her passions – people, books and research—into a fun and exciting career. Membership brings benefits that keep you coming back - for critically acclaimed exhibitions and programs from established and emerging artists that help to inspire, explain, and define the world around us. Your membership support provides the foundation for our exhibitions, education programs, publications, community projects, and more. Take advantage of great benefits, and support the vitality and diversity of arts in our community. Los Gatos artist Marie Cameron is drawn to the ephemeral nature of our vanishing orchards and crumbling shorelines depicted in her lyrical and intricate paintings which speak of loss and hope. A native of New York, Marie was strongly influenced by her upbringing on the east coast of Canada where she grew up surrounded by apple trees and high tides. It is here that she earned her BFA degree, worked as a painter, designer and illustrator and enjoyed her first exhibitions. Marie’s work has been exhibited in the US, Canada, England and Italy. 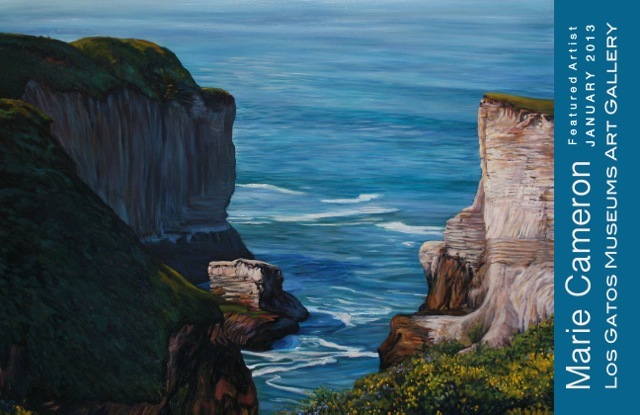 She is a member of both the Los Gatos Art Association and the Pacific Art League of Palo Alto. Her work is widely collected and can be viewed on her website or in person at the Los Gatos Museums Art Gallery, or by appointment in her gorgeous new studio in Los Gatos, California. Share your passion for art and history. Enjoy invitations to exclusive events! Be a part of our exciting new Volunteer program! Copyright © 2013 Los Gatos Museum Association, All rights reserved. You are receiving this email because you either opted in at our website or when you signed up at one of the Museums.